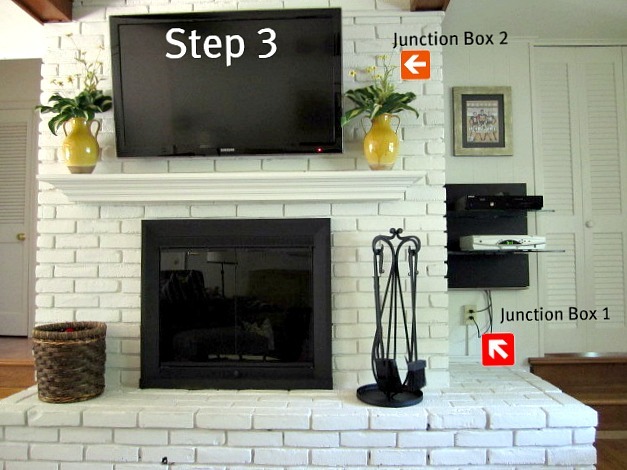 The steps to mount a tv on a brick fireplace. Includes how to hide the wires, install junction boxes, and display components. I received a few questions on how exactly we were able to mount our TV on a brick fireplace. It wasn’t easy, it took some time and it was a step-by-step process. I pretty much googled everything and had help from a carpenter. Here is the orientation of the room. We were lucky to have a crawl space under the room. The cable outlet was in the corner behind the brown chair. We ran the wire under the floor and came up in the corner by the steps. The cable company came and ran the wire for me. It was necessary to drill a hole in the floor because there was no other way to get the wire where it was needed. I had a carpenter come and install molding along the stair and along the brick to hide the cable wire. I stained it along the floor and painted it along the brick. The carpenter did double duty by installing 2 junction boxes. One on the wall and one on the brick behind where the TV would hang. Here is a pic of the junction box behind the TV. He got the hook-up for the electric from the beam in the ceiling. We have track lighting and he was able to splice into it somehow. Here is a pic of the beam. I googled “TV component shelf” and a bunch of options came up. I decided on this black one because I thought it would match the TV and the fireplace doors. My little carpenter guy hung it for me. He also installed the cord cover. I’m not sure how he actually did that though…he either nailed it in the brick or glued it. Before we painted the room the cord cover was quite obvious on the brick. After we painted it totally disappeared. I had a question in regards to how hard it was to paint the brick.We primed it with an oil-based primer (yes, it smelled pretty bad) and used a thick roller followed by a brush. Then 2 coats of the wall paint. More time-consuming than difficult. I put the pillow baskets in front of the outlet to sort of hide the plugs. The pillows look lovely on the sofa but the reality is that we actually sit on the sofa. The pillows end up on the floor so I keep them in the baskets most of the time. The installation of the mounting hardware was much easier than I expected. We used concrete sleeve anchors but you could also use Tapcon anchors. I had a question about the height of the TV. My son was absolutely sure it would be too high and that we would all have whiplash. I solved the problem by lowering the mantel as far as possible. The TV is hung about 5 inches above the mantel. We used an adjustable mount that allows us to tilt the TV sort of forward. Oh and by the way, our necks are just fine. Someone asked if the TV could be damaged if we lit a fire in the fireplace. I googled that very thing before we even bought the TV. There is a little thermostat you can buy that measures the heat going up your chimney. If the heat is below a certain point, it’s safe to hang a TV. We didn’t have enough room in the cord cover to run the cord for the DVD player. Instead of opting for a second cord cover, we decided to not keep it plugged in all the time. We plug it in when we want to use it. Like any other home improvement project I attempt, there were hurdles and delays. From start to finish it took about 3 months. We love it though…and like most things that are a total pain, in the end it was worth all the hassle. Ann great job, cords showing make me crazy! You certainly go to great pains to do it "right". 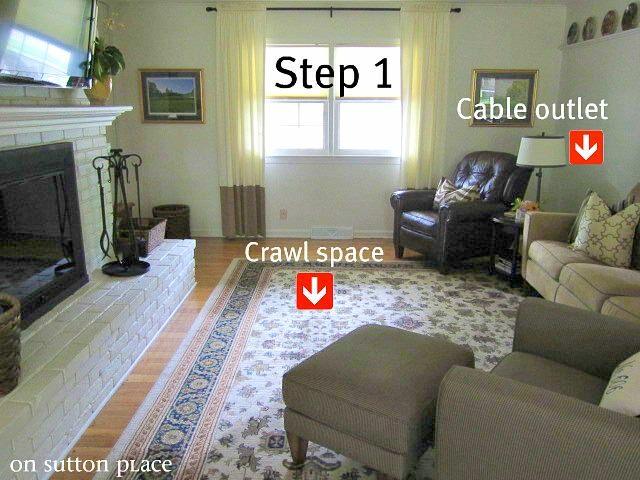 I lived with my cable cord running across the front of my sliding glass doors for almost a year! I finally moved the TV back to where previous owners had theirs.I can finally sleep at night now!! Where there's a will there's a way! Love your white brick. P.S. 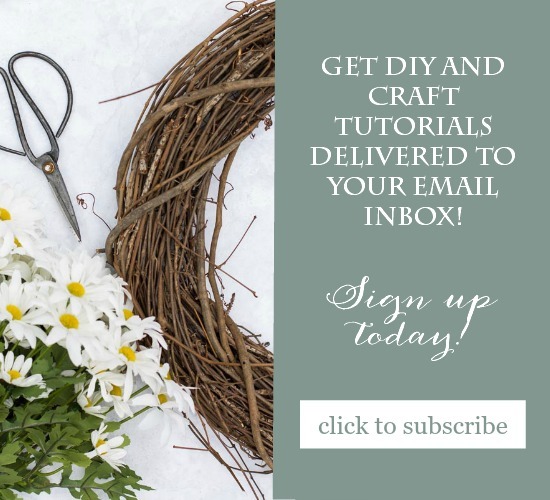 You're featured on my blog tonight from last week's link party! What a helpful and explanatory post! I really like your arrows and directions. Thanks, Ann. You have a beautiful home and it's just my style! What a lot of work, but it looks fantastic. I am a new follower. Thanks for following and your sweet comments. Can't wait to see what else you do. Thanks so much for that information. And since I asked about the heat I really appreciate that one. :) We just might need to move our TV. Bravo! And if I ever need to do this, I'm calling you!